Pioneers in the industry, we offer salt grader and vibro energy separator from India. 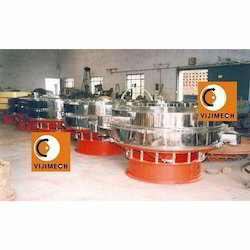 Vibro Sifter Sieves usually use vibration energy or a combination of Vibration ultrasonic energies to achieve screening. Sieves have to be specially designed to resist the high tensile stress generated. Since Particle Size Distribution plays a vital part in drug dissolution, maintaining the accuracy of the sieve apertures is an essential part of sieve manufacturing. Proper thickness of wire, accurate nominal aperture sizes, high tensile strength tautness of the sieve are essential for high sifting performance.